Nurha Business Group is an Investment Group which has about six companies (Right Fresh Farm, Raha Milk Processing, Nuredin Hassen Strawberry Farm, Nuredin Juice and Jam, Munich International Business and Kenmusa real estate) operating in agriculture & agro-industry, manufacturing, real estate development, trade & commerce, import and export businesses in Ethiopia. The compnay is owned by Nuradin Hassen, started operation in 1996. It is the a private investment Group engaged in multifaceted investment undertakings that have proved to make significant contributions to the development of Ethiopia’s economy. At Nurha, over the years, one philosophy has been consistent; that everything we do, however small or big will be at the best quality. For this, we have won International recognition and awards as well. Right Fresh Farm was established in 2009 with initial capital of 15 Million ETB in Addis Ababa, Ethiopia.Having three related entities under it's name that are involved in the business of healthy food and beverages service sector, Right fresh farm is currently providing more than 30 varieties of vegetable and 20 different types of fruits in our market. And also Right Fresh Farm have created job opportunites for more than 20 permanent employees. Nuredine Strawberry Farm was established in 2003 initial capital of 23 Million ETB in Addis Ababa, Ethiopia.It is currently producing Yummy Strawberry jams under the name RAHA JAMS.Sweet and simple Raha Strawberry Jam is not your regular, run off-the-mill Strawberry Jam. After all, its source for strawberries is Nuredin Hassan's organic strawberry farm. While Nuredin's strawberries are more expensive than other strawberries, due to being organic, the price of his strawberry jam is on the other end of the spectrum.We addresses a wide market range supplying for supermarket, bakeries, mini markets, governmental organizations like Universties.Nuredine Strawberry farm created job opportunites for more than 52 employees permanent working in the factory located at Hanamariam, Addis Ababa. Nuredin Juice and Jam was established in 2003 with initial capital of 63 Million ETB in Addis Ababa, Ethiopia.We provide a yummy strawberry jams under the name RAHA JAMS.Nuredin Juice and Jam addresses a wide market range supplying for supermarkets ,bakerys, mini markets and governmental organizations like universities.We plans to increase our capacity to produce more varities of flavours like Mango Apple and Pineapple both to local and foreign markets. Munich Interna tional Business was established in 1999 with initial capital of 32 million ETB in Addis Ababa, Ethiopia.Munich International Business imports a wide range of speciality foods from all over Europe including such brands as HUMANA, HAHNE, MUSLIS.We have with over 31 permanent employees.We also plan to expand its network and import more products from the europe in the future. Kenmusa real estate was established in 2008 with initial capital of 90 million ETB in Addis Ababa, Ethiopia.We are now currentlly building 8 store multi-purpose shopping center and residential appartment in Addis Ababa 4 killo area and 19 store multi purpose building around bole area.Kenmusa real estate have more than 30 permanent educated employees and many more than 100 temporary employees.Kenmusa real estate is a sister company of Nuredine real estate also planing to expand to easter shoa zone Adama city soon. Nuredin Hassen Strawberry Farm owns an organic strawberry farm and produces strawberry jam in Ethiopia. The farm exports fresh strawberries to Dubai, Djibouti, and Yemen, and employs 110 people, including 93 women. Nuredin also sells fresh produce locally. The farm is also sending strawberries to a local processing plant to make jam. T he farm plans to continue expanding strawberry production and invest in a new packhouse, which will generateb additional employment. Nuredin Hassan, the farm’s owner has seen his dream come true with the success of his business and he wants to help others prosper as well. Sweet and simple Raha Strawberry Jam is not your regular, run off-the-mill Strawberry Jam. After all, its source for strawberries is Nuredin Hassan's organic strawberry farm. While Nuredin's strawberries are more expensive than other strawberries, due to being organic, the price of his strawberry jam is on the other end of the spectrum. This is due to the fact that, when Nuredin decided to make strawberry jam, he was simply looking for a way to save the strawberries that he periodically couldn't sell. It is due to this simple fact that his jam has one of the highest concentrations of strawberries per jar. Other jams are often made from the pulp of various fruits, even cucumber, and then artificially colored and flavored. However, anyone can tell from looking at all the strawberry seeds in Raha Strawberry Jam that it is made from real strawberries without any other fruit added as fillers. True to Nuredin's organic strawberry farm, it also contains no artificial colors or flavors and no preservatives. A few imported strawberry jams may be made without other fruit fillers, but they still contain artificial coloring. This is usually because they have cooked the strawberries, stored them for up to a few months, and then cooked them again. When this process is used, the strawberries lose their bright, natural, red color and turn a dull, unappetizing brown, requiring artificial coloring to be added. 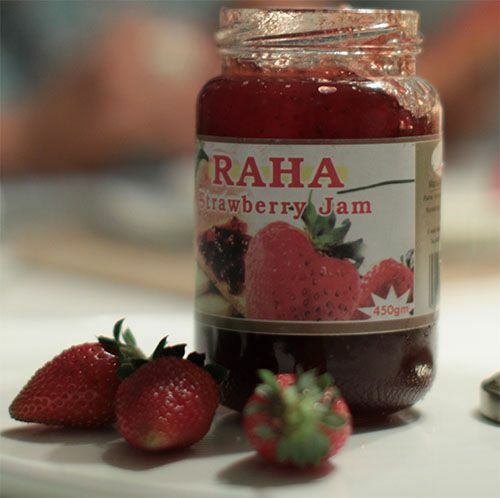 Raha Strawberry Jam is only cooked once and is not stored for extended periods of time, retaining its natural color. Some jams are watery and sloppy and slide off a knife too easily, while other jams are so thick that they don't spread evenly, but Raha Strawberry jam has the perfect consistency for easy spreading, making every bite as good as the last. The name Raha means relaxed and feeling good in the Harrari tongue of eastern Ethiopia. It is also a combination of the first two letters of Nuredin's mother's and father's name, reminding consumers that Raha Strawberry Jam is a great tasting and health treat for the whole family.